How Do Bands Make Money Today? It’s a well-known fact that the traditional music business has more or less flip flopped on itself following the turn of the century. Record sales were once the primary driver of the industry, with bands touring and selling merch in order to promote an album. Now, a recorded album is often a loss-leader for touring and merch, which now drives the industry. Consequently, the way bands make money has drastically changed over the last few decades. Keep reading to find out how each of these revenue streams work, as well as gaining a few pointers on how your own band can take advantage of them. Touring/live performance ticket sales serve as the primary source of income for most bands today. Tickets are often sold on a tiered system, with each succeeding tier featuring more preferable seating and/or VIP add-ons. VIP add-ons may include a meet-and-greet with the band, album signing, soundcheck attendance or an acoustic session earlier in the day. How you can earn money from touring/live shows: Once you’ve honed your skills in a live environment and began building a solid fanbase, you can either start charging for your own shows or support more established bands. Tickets for an unsigned show generally range from $5-$15. If you’re booking your own show, you will most likely have to place a deposit with the venue. Therefore, it’s highly recommended that you shop around to find the best deal and start promoting the show well in advance to ensure you break even. If you’re dealing with support slots (either playing one or featuring a band as part of your own show), you’ll have to come to an agreement on how to split the income. Merch is often the second main income source for bands. Whilst clothing is often the go-to product for merch, many bands feature an entire product range. This can include coasters, bottle openers, tote bags, mugs, posters and more. Merch is often designed by a graphic designer and then manufactured by a supplier, before being sold at a marked-up price by the band. 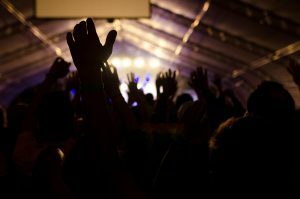 How you can earn money from merch: I firmly believe that you should invest in merch as soon as you start playing live. When you’re first starting out, your main priorities will be honing your live skills and building up your following. As you will most likely be playing free or low-paid gigs, merch is a great way to recoup travel expenses or even make an overall profit. In addition, those who buy your merch are essentially paying to become walking billboards for your band. People will think nothing of spending a small amount of money on a shirt or a bottle opener, especially if they liked your set. Most merch is cheap to manufacture and you can get started with as little as $100. Profits can also be re-invested in order to scale up your product range. When scaling up your product range, it’s worth including both low-priced and high-priced items in order to appeal to as many people as possible. Additionally, make sure your clothing is seasonally appropriate; hoodies might be a great investment in October, but a poor investment in May. If you’re looking to get started, I’d highly recommend Printful as a supplier. They feature a wide range of products at extremely affordable prices and also offer dropshipping services. Music publishing is a significant, yet often-misunderstood income source for bands. Like all intellectual property, songs and recordings come with a set of rights. When a song or recording is used by others, the owner(s) of the property are entitled to various royalties. Organizations that use intellectual property (such as radio stations, streaming sites and venues) are required to pay a license each year, from which those royalties are distributed. Royalty collection and management is a somewhat complicated and time-consuming process, which is why most bands sign with a publishing company to do it for them. Publishing companies make money through commission and also provide other services, such as pitching music for sync deals. 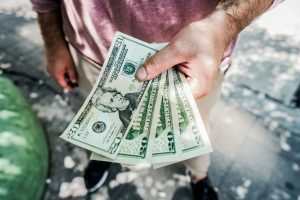 How you can earn money from music publishing: If you’re writing original music, making recordings and and having your assets used by others, you’re entitled to royalties. I’d strongly recommend signing to a music publisher as soon as you start releasing new music; this will ensure you receive all royalties you’re owed from each live performance, radio play etc. Additionally, most music publishers will actively pitch your music for sync deals, which can be very lucrative. If you’re looking for an effective and fair music publishing deal, I’d highly recommend Sentric Music. They effectively collect and manage royalties as well as actively pitching music for sync deals. They take a flat 20% commission on royalties and 25% on sync deals with no initial setup fee. Sync deals have seen a significant surge in popularity following the decline of traditional record sales. In short, a sync deal enables bands to make money by having their music featured in some kind of visual media (movies, TV shows, video games etc). In a sync deal, an intellectual property owner (such as a band) grant a visual media business with a music synchronization license, allowing them to use their work in an agreed form of visual media for a flat fee. Sync deals can be incredibly lucrative, often netting a band thousands (or even hundreds of thousands) of dollars. How you can earn money from sync deals: The good news is that you don’t have to be signed to a record label or have a significant following to land a sync deal. In many cases, you simply have to have great music . If you’re hoping to land a sync deal, you will usually need instrumental versions of your recorded music (lyrics can sometimes get in the way of narration in a TV ad or movie). Additionally, you will need versions with clean lyrics (swearing is almost always a no-go when it comes to daytime TV ads etc). The best way to submit your music for sync is to sign up to a music publisher that will pitch your music for you. Much like sync deals, brand partnerships have seen significant traction as a main source of income following the decline of traditional record sales. This is where a band makes money by either endorsing a particular brand’s product or service, or working with a brand to make a signature product. Common brands that bands partner with are musical instrument manufacturers, clothing lines, social media app developers and grooming product lines. How you can earn money from brand partnerships: This one is going to be much more difficult to take advantage of until you have a sizeable following. Understand that brands are paying to get their product in front of an established audience, not trying to help you grow one from scratch. One of the best ways an independent band can make a consistent income from brand partnerships is by having a solid online presence and a significant social media following. Once you have an established online presence, you will start to see endorsement requests from brands on a consistent basis (often in the form of sponsored posts, social media takeovers, product reviews etc). Whilst you might not be designing a signature line of Gibson guitars for a few more years, there’s no doubt that you can make a regular income from brand endorsements. Whilst many independent musicians are quick to dismiss the earning potential of streaming services, it often serves as a fantastic source of income. Whilst payouts are indeed much smaller than traditional record sales, they add up over time and provide a healthy source of income for artists with monthly listener numbers in the hundreds of thousands. More importantly, streaming services often act as social platforms and introduce new listeners to your work on a regular basis via algorithmic playlists. This allows you to grow a dedicated fanbase, which can be monetized long-term via more lucrative income streams (such as touring & merch). How you can earn money from streaming: Firstly, you’ll need to go through a digital distributor in order to get your recorded music on streaming services. The most affordable and artist-friendly distribution service I’ve found is Distrokid; they allow you to upload an unlimited amount of music and retain 100% of your rights for only $19.99 a year (many competitors charge double that for a single album). You can also receive a 5% discount on your first year of distribution by using this discount code. The giant of the streaming world is undoubtedly Spotify; for more information on how to grow and monetize a Spotify following, check out our article How To Organically Grow Your Spotify Following [FULL GUIDE]. Whilst physical music sales have certainly taken a significant hit since the turn of the century, they are still a viable income source for bands. CD’s are almost always available at the merch table due to the fact that they’re incredibly cheap to manufacture. Many bands also do limited vinyl record runs, which are often sold as collector’s items. How you can make money from physical music sales: The easiest way to get started with physical music sales is to produce CD’s that can be sold as part of your merch. These can be sold for just a few dollars and can be bundled with other merch items (such as t shirts). The most effective and affordable way I’ve found to get CD’s duplicated is to go through Atomic Disc; they offer a wide range of duplication options and you can get duplications for under $1.50 per unit. Additionally, if you’re designing your own artwork, I’d thoroughly recommend investing in Adobe Creative Cloud. This will allow you to use the industry-standard Photoshop platform for only a small monthly fee, along with a host of other platforms for video editing and illustration. Pingback: What Do Record Labels Look For When Signing A Band Or Artist?